Åland is a small autonomous where is located North Europe and there are not many chat rooms which are related with this country on internet. However there is only one which has been published by World Chat Online and powered by TinyChat. 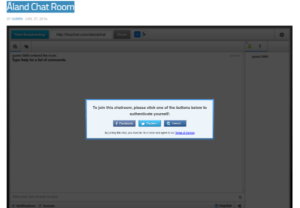 This is a video chat room where you can communicate with people with your camera, microphone or keyboard. You can pick one of these options. However you won’t meet many people on the chat room. We recommend you to seek for people from Åland on Facebook and Twitter first. This is going to be a good option for you. You don’t need to register to the website and you can enter to website with your Facebook account if you want. If you would like to register to the website, you are going to have a permanent nickname. If you don’t want to have a permanent nickname you can still enter the website as guest. However you won’t able to use some camera features if you don’t have a registered account. The site language is in English but people generally will speak in Swedish on the website.